The Georgia School for Innovation and the Classics (GSIC), a charter school for students from kindergarten to Grade 9, is bringing back an old-school way to ensure students don’t get out of hand. The school sent consent forms home with students, asking parents to sign off on school staff paddling their child as a form of discipline. GSIC Superintendent, Jody Boulineau, say that roughly one-third of parents have given consent. The policy states that students will have “three strikes”, in which a third offence merits a trip to the principal’s office. 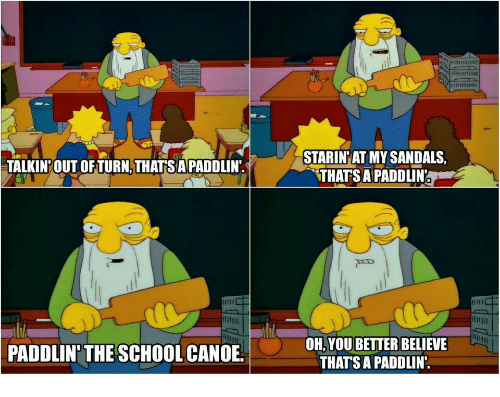 If the parents consented to a paddling, the student “will be taken into an office behind closed doors. The student will place their hands on their knees or piece of furniture and will be struck on the buttocks with a paddle.” No more than three “licks” will be issued and an adult witness needs to be present. Any parent who have not given their consent must agree that their child could face up to a five day suspension.